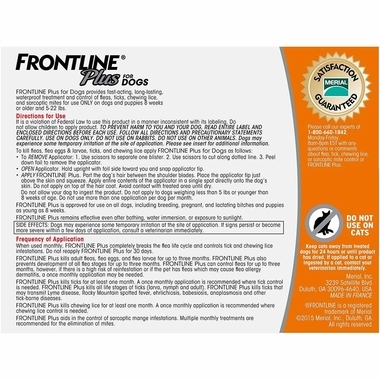 Recommended by veterinarians, FRONTLINE Plus Orange for Dogs 0-22 pounds is a powerful and easy-to-use formula designed to quickly and effectively kill fleas, ticks, and chewing lice. FRONTLINE Plus is specially formulated for dogs and puppies aged eight weeks and older weighing less than 22 pounds. Available without a prescription, FRONTLINE Plus only needs to be applied once a month for thorough pest control. 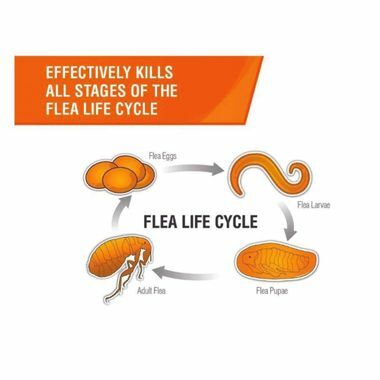 This powerful formula kills up to 100 percent of existing fleas in the first 12 hours after application, and it continues to kill new fleas for at least one month afterward. FRONTLINE Plus prevents the development of new fleas by destroying flea eggs and larvae and by destroying adult fleas before they have a chance to lay eggs. 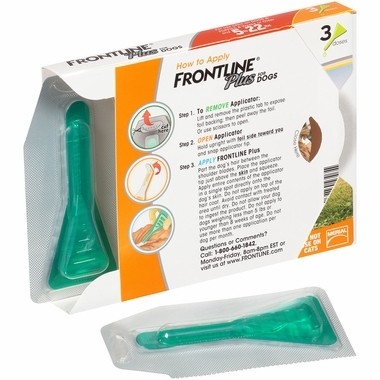 FRONTLINE kills chewing lice and all four major ticks, including ticks that may carry Lyme disease, keeping both your pet and your family protected. Thanks to its waterproof formula, FRONTLINE Plus won't rinse off when you give your dog a bath or when your dog goes for a swim. The active ingredient in FRONTLINE, fipronil, is stored in the natural oils in your dog's coat, so your pet is sure to stay protected no matter how many puddles he or she tramps through. 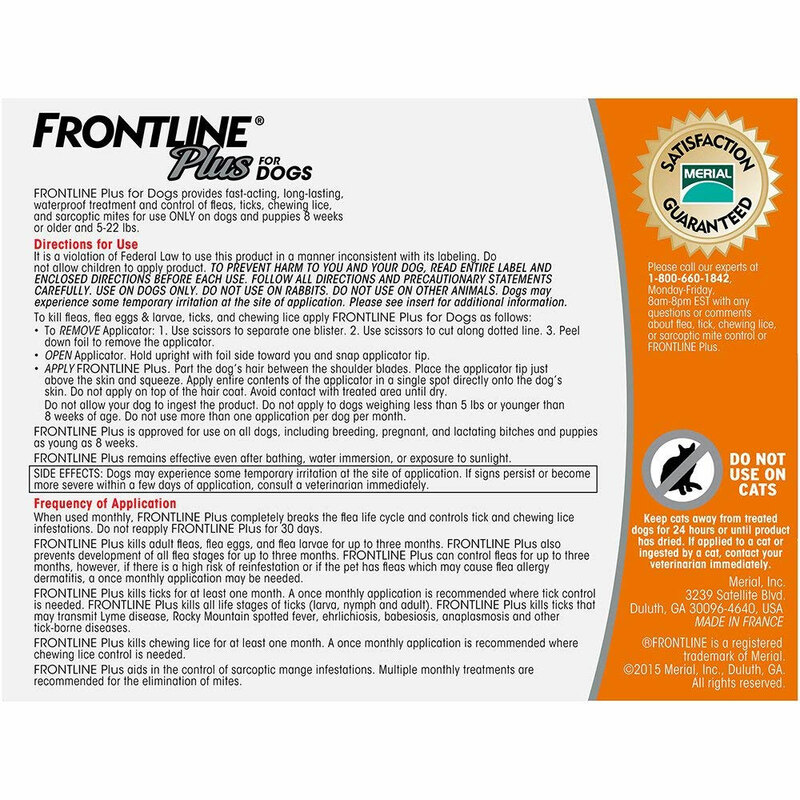 This FRONTLINE Plus product is EPA approved and registered, so it's guaranteed to be the exact same product sold by your Veterinarian. Click here for more information on EPA-approved pet products. 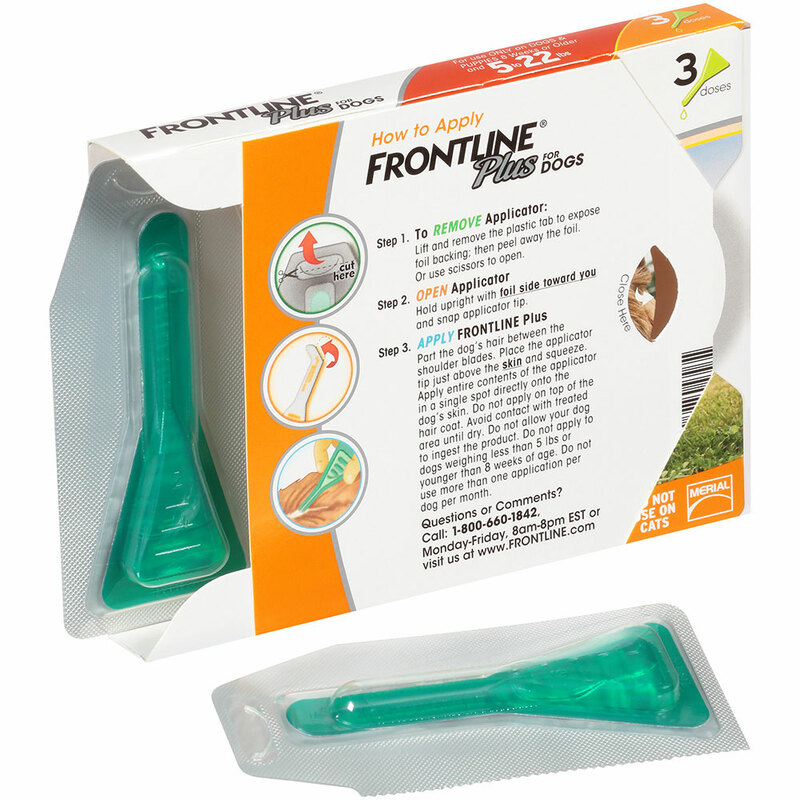 Box includes three 0.67-milliliter tubes of FRONTLINE Plus for Dogs. All about fleas and prevention. 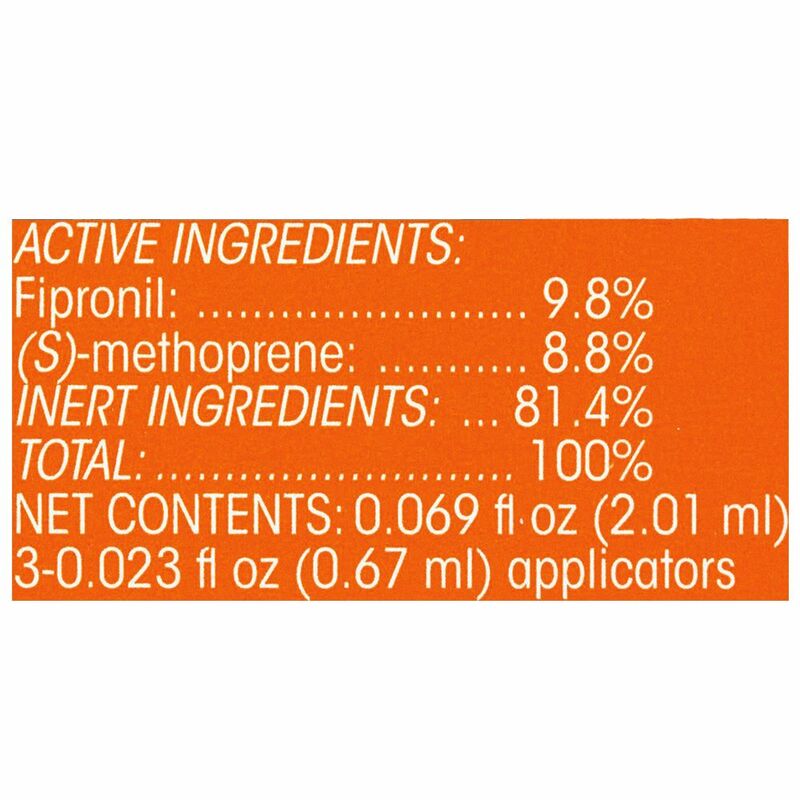 Fipronil is a manufactured insecticide that works on a cellular level on adult fleas and ticks. It seeps into an insect's cells and blocks chlorine molecules from passing through. This stops the nervous system from working and paralyzes the insect. Fipronil kills adult fleas and ticks on contact or when consumed, and it can be spread from one insect to another. Because fipronil is so strong, it only needs to be applied once a month to continuously kill fleas and ticks. Once it is applied with an oily liquid to keep it on the skin of your dog, it slowly seeps into the hair follicles and oil glands where the fleas and ticks live. To kill adult fleas and ticks. Methoprene is an insect growth regulator, which means it works by affecting the eggs and larvae of fleas. 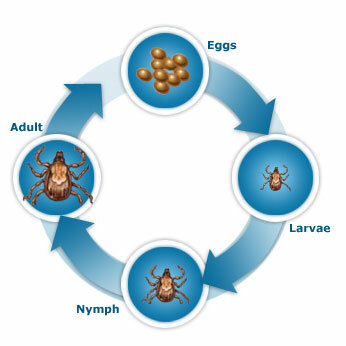 It interrupts normal levels of growth hormone, preventing a juvenile flea from growing and molting, leading to death. Specifically designed to target developing larvae and eggs, methoprene prevents a flea population from increasing. 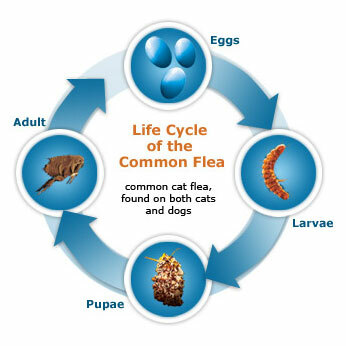 To break the flea life cycle and stop further infestation. Some animals are sensitive or allergic to the ingredients in FRONTLINE, so be sure to watch for any signs of allergic reaction. If your pet shows signs of itching, restlessness, nausea, lethargy, or breathing difficulty, seek veterinary attention immediately. Use FRONTLINE Plus for fast-acting, long-lasting flea and tick control. 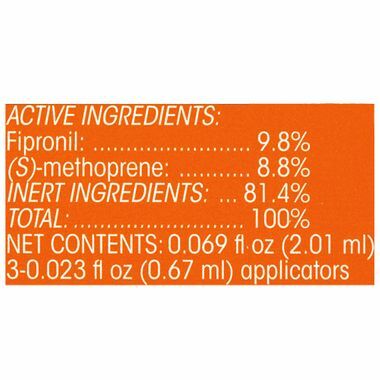 When you apply FRONTLINE, fipronil, the active ingredient, is stored in the oil glands under your pet's skin. It's then distributed continuously to the skin and hair of your pet through the hair follicles. 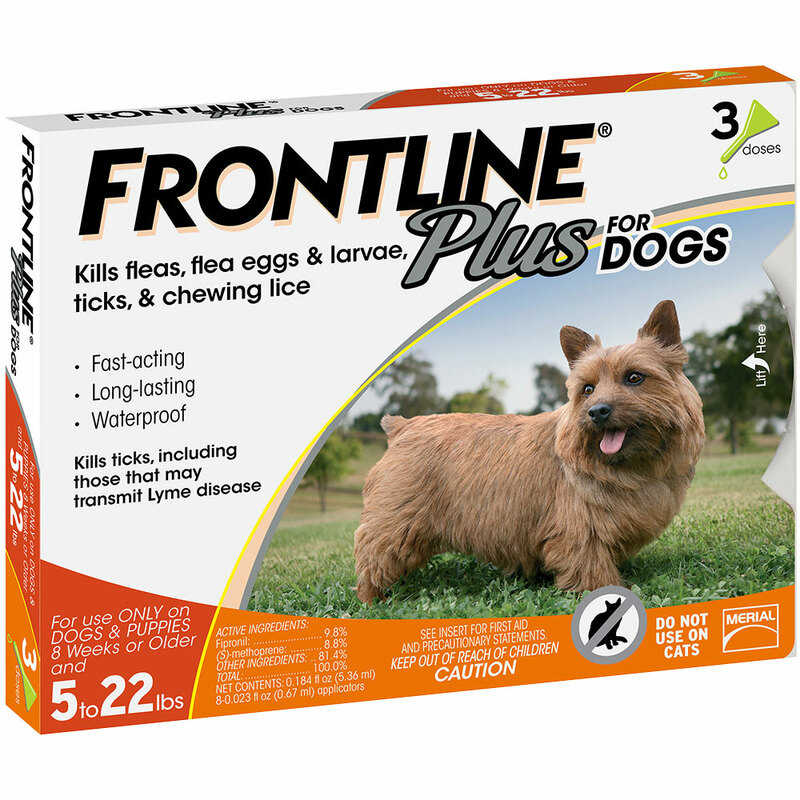 This way, FRONTLINE provides waterproof, month-long protection against future pests while breaking down the flea and tick life cycles. 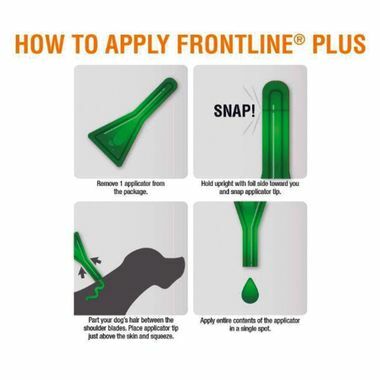 Applying FRONTLINE Plus to your pet is an easy three-step process. First, remove the Frontline Plus applicator from the child-resistant package and cut or lift off the plastic tab to expose the foil and then peel the foil down. 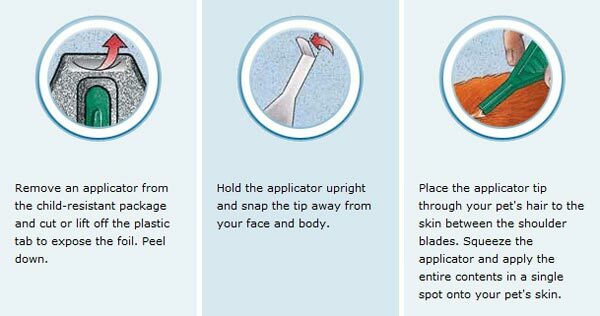 Next, hold the applicator upright and away from your face and body and snap off the tip. 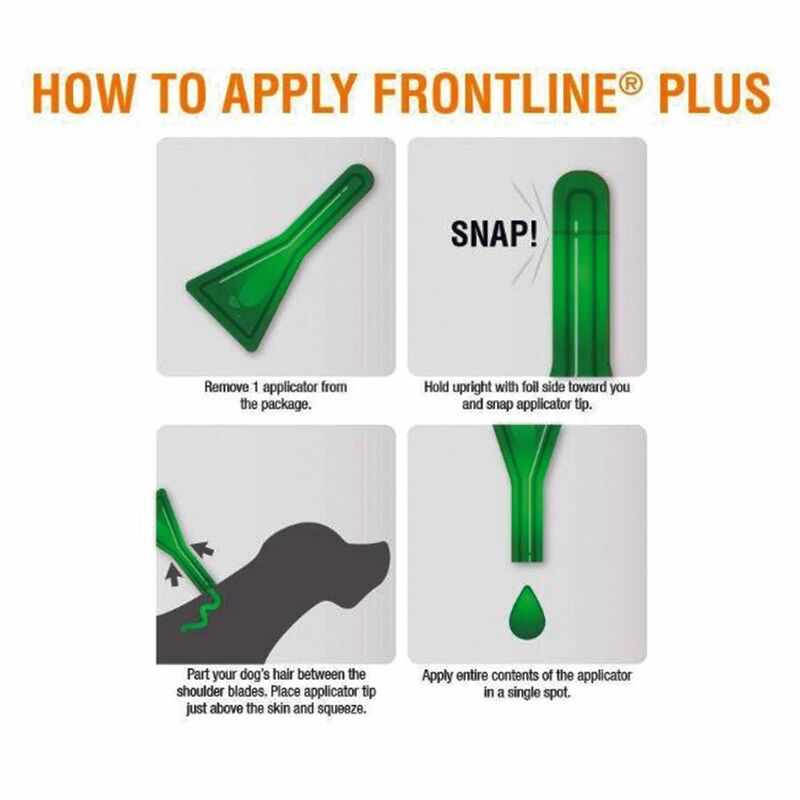 Finally, place the Frontline Plus applicator tip on the skin between your pet's shoulder blades and squeeze the applicator to apply the entire contents in a single spot onto your pet's skin. To prevent harm to you and your pet, read the entire label and enclosed directions before each use. Follow all directions and precautionary statements carefully. To prevent harm to you and your pet, read the entire label and enclosed directions before each use. Follow all directions and precautionary statements carefully. Always point the applicator away from your face, especially your eyes, and wash your hands thoroughly after application. USE ON DOGS ONLY. Do not use on rabbits or other animals.